Challenge Games work well as an activity to include as a session in a day program or overnight camp. 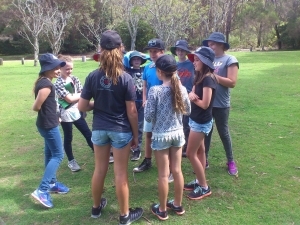 Challenge Games also form a part of our Leadership Programs and work well alongside Peer Support activities. Acid River – students are required to cross an ‘Acid River’ with only the available equipment. 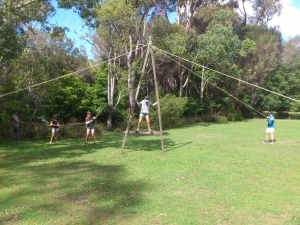 A Frame – students are required to transport one group member using only the A-frame and ropes. Espionage Raid – students must retrieve boxes of secret files from an inner compound without losing any members. Chains Apart – students must use the support of a team member to travel along two diverging chains. Nitro Crossing – students are bushwalkers trapped with only one way out. They must swing across a ‘chasm’ to safety with all their equipment. Squares – students must traverse a set of four intervals of chain using only one support rope that must also be shared with other players. 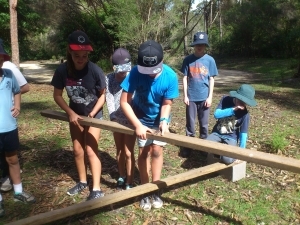 The Log – students are bushwalkers that must negotiate over a ‘rock wall’ to complete their trek. Keep in Step – Students need to coordinate their steps as they ‘walk’ as a team across an open area. Communication Challenge – students work in pairs to complete challenges that require verbal and listening skills and challenge their communication skill. Reversibility – all team members must reverse their order while balancing on a plank. Note: Some of these activities can only be run by Bournda EEC staff who have completed necessary training and follow procedures to ensure the safety of your students.